On Saturday Blackpool and West Ham go head to head in the Championship play off final at Wembley in what should be a clash of contrasting styles which offers a feast for the spectators, partisans and neutrals alike. If you know anything of either Ian Holloway or Sam Allardyce as people you’ll have a fair idea of what to expect from their teams as their teams reflect who they are. Allardyce is a big, imposing man, who as a player was strong in the tackle and committed in the air. Holloway was more technical, buzzing with energy and more gritty and determined than his modest frame suggested. On the other hand, Allardyce is often portrayed in the media as a belligerent ignoramus and Holloway as class clown. However, they are both very studious about the game and they understand their game deeply. Everything about this final suggests that it should be a fascinating battle, with two teams from different ends of the footballing spectrum meet head to head. Game strategies here won’t be overly occasion specific, in that each manager is likely to stick to what they know. Allardyce appears to have a key rule in his strategy, stop the opposition and then build from that base with well-balanced attacks through direct passing and crosses in to the box. Holloway on the other hand will seek to control possession and escape any pressure exerted by West Ham, build through the team and attack relentlessly for the majority of the game. 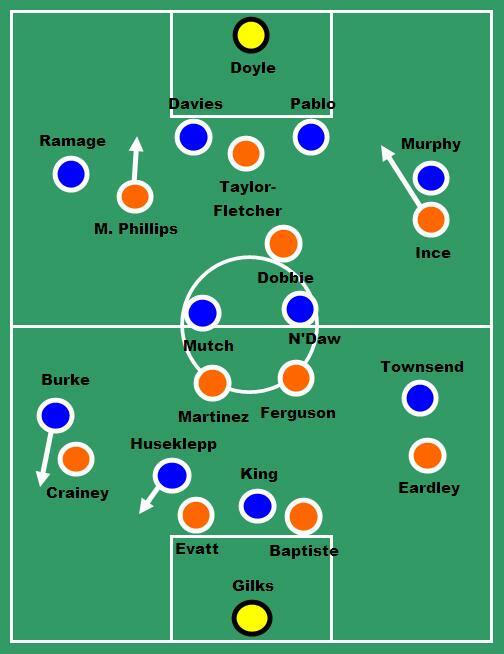 From a formation perspective Blackpool are expected to line up in a 4-2-3-1 formation which offers more balance than their gung-ho 4-3-3 from last season’s Premier League campaign. 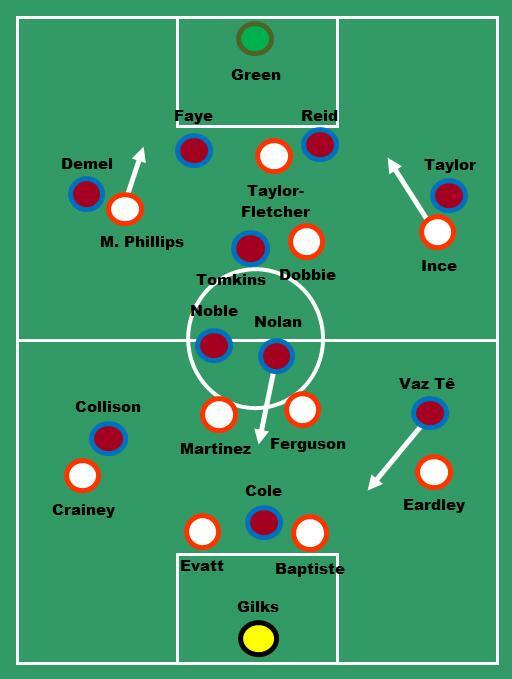 West Ham on the other hand tend to favour a 4-4-1-1 framework, but in the first hint at the battle about to commence may try to block up Blackpool by switching to a 4-1-4-1. The use of a 4-1-4-1 means that West Ham and Blackpool will match up relatively neatly across the pitch which essentially means two things. The team that wins the critical individual battles will gain a foothold and the team that utilises the space available will be at an advantage. The ‘battles’ are essentially something that will pan out on the day and non of them are easy to call. The midfield as always will be crucial, with the likes of Mark Noble and Barry Ferguson trying to lead their side by example with good challenges, reclamation of the ball and good use of the ball once in possession. Down the flanks full backs will be fully engaged and arguably the team with the better full backs will enjoy a great advantage. 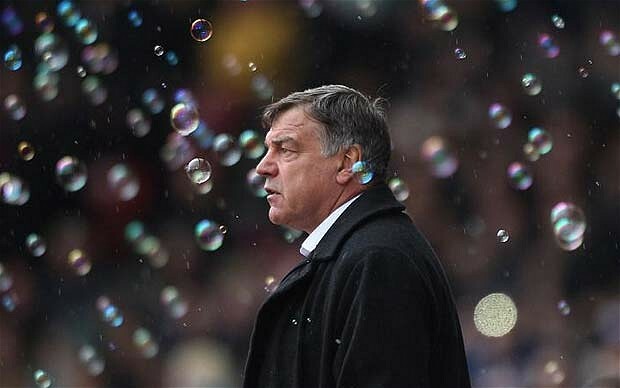 However, the critical battle may be focused on the formation switch that Allardyce is likely to make. His holding midfielder (in this example James Tomkins) will likely be deployed to pick up Stephen Dobbie. Dobbie will attempt to float between the West Ham midfield and defence hoping to receive the ball to feet and link up with the other three forwards as well as engaging in one v one encounters where he’ll seek to use his dribbling ability to take men out of the game. 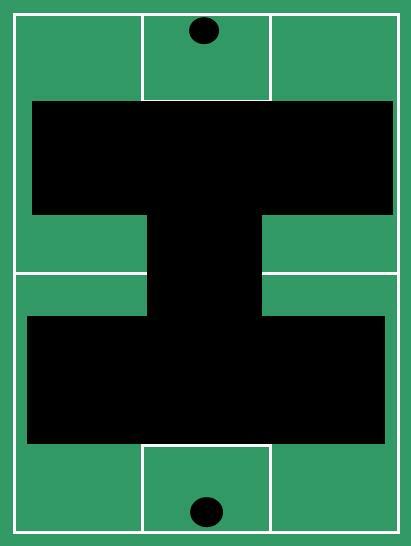 Knowing where the space is on the football pitch is always critical and although ‘in game’ this is a very dynamic element there is a way of highlighting some theoretical elements from accepting players positions in relation to the space. The diagram below effectively blanks out the spaces covered by the players leaving only the areas that are available. The most obvious aspect of the diagram above are the spaces beyond the defensive line. How will each manager try to exploit that area? Firstly, Allardyce is renowned as a long ball exponent, in truth, his sides show greater balance to their play than that, but he will seek to build play around a long ball or two in order to gain a foothold around the final third. Primarily, their main long ball is far from aimless, in fact it is highly structured and very dangerous. Usually the long ball emanates from the centre back (1) after a passage of brief passes along the back line. It’s aimed to the centre forward who will seek to flick on the ball (2) to runners who go beyond the heading player and in behind the defence. Normally this will be someone like Kevin Nolan. The other element is that his midfield will position (3) to pick up on the loose ball and then build a second phase of attack should the first fail. It is here where the game will be in balance and requires diligent work from Blackpool to firstly win the header and then for Angel Martinez and Ferguson to pick up on the second balls. 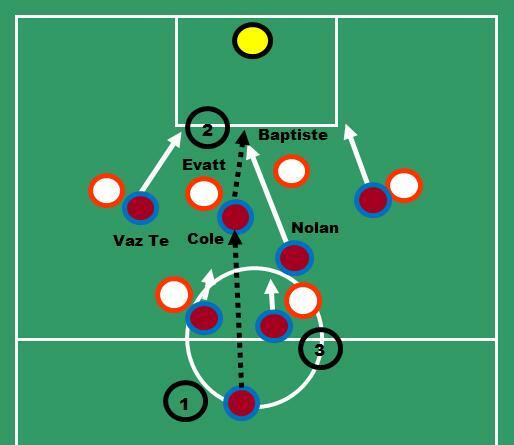 Alternatively, should Cole win the flick on, then Alex Baptiste will need to pick up the runner most likely to benefit. (1) The long pass is made. (2) Forward attempts to win header and runners seeks to collect the ball. (3) If the ball drops back central midfielders look to pick up the second ball. Alternatively, Ian Holloway will look to either feed the ball to the feet of his wide forwards so that they can be isolated against the opposition full backs with the intent to beat their marker and run behind the defence with the ball at their feet. In addition to this, Blackpool’s possession as it progresses higher up the field will allow their midfielders to play the balls in to the channels and in behind the West Ham defence on to well-timed runs from their forward line. Should either team’s attempts to get in behind the opposition fail then the middle flanks of the pitch may well be the focus for developing plays. Holloway has a reputation for encouraging his full backs to attack, in recent weeks they’ve tended to sit a little deeper, however, he may ask them to step up to combine with their attackers to isolate opposition full backs to break in behind the defensive line. Allardyce also enjoys having two full backs in Matthew Taylor and Guy Demel who can be attacking in their play and he may ask them to push high up the pitch seeking to get in to crossing situations and assist with getting good quality delivery into the penalty area to develop situations. In beating Blackpool 4-0 at Upton Park earlier in the season Allardyce revealed in his BBC post match interview where he thought he could break Blackpool down. Essentially he remarked about two things, exploiting Blackpool’s off the ball shape and getting down the sides of the centre backs. This is very enlightening indeed as it acknowledges Blackpool as being a side who are poor out of possession, but Allardyce would be remiss if he thinks he’s encountering the same Blackpool side. The deployment of two holding midfielders as well as the restraint on the full backs to move forward has not only added greater balance to their side off the ball, but assists with the second element of exposing the sides of the centre backs. Holloway will no doubt be working with his side on his off the ball shape knowing that this is where West Ham are likely to exploit them. Off the ball West Ham are a treat, they are genuinely fascinating and set up very subtlety to make the most out of positions, as above when the ball goes long, positioning and pressing are key, but it is at set pieces where they come in to their own. Too much emphasis is placed on marking systems and winning the aerial duels at corners and other set pieces and little attention is placed on what is going on elsewhere. In his column the Guardian Secret Footballer (@TSFGuardian) exposed the lengths that Allardyce goes to (as do other managers) exploit these situations. Jack Collison’s goal against Cardiff in their first leg was a classic example of such positioning, albeit in reverse to the situation outlined above. Holloway will have to ensure that his new-found corner set up places as much emphasis on the happenings outside of the box as it does on the new-ish zonal positioning inside the box. What is interesting in any game against a side managed by Sam Allardyce is how the crowd unwittingly knows he has executed his game plan. If after twenty minutes of this final the Blackpool fans are saying, ‘but we just aren’t ourselves’, or ‘we’re playing awful’, then he’s achieved objective one. The key for Blackpool is to not be put out of their stride, play to their strengths, if the door to the final third is closed, retreat and try again. Keep the ball moving on the floor, quickly and accurately, move West Ham around the field, make them chase the ball. West Ham offer a more dynamic and proficient version of the Birmingham side they have just beaten with the same approach, here they will need to go further, and excel beyond the standards that they’ve set this season. West Ham possess talent in abundance, but arguably their key men are focused in midfield and attack. In Kevin Nolan they have someone who holds few secrets, he will use his strength to dominate opponents both on the ground and in the air as well as having an ability to read play acutely so that he can time late runs in to the box. Alongside Nolan, Mark Noble will aim to control the game in possession and through his pressing. He adds the energy and subtlety that keeps West Ham ticking over. Blackpool will need to deny him time on the ball and escape his attentions when he is buzzing about the pitch closing out space. The January acquisition of Ricardo Vaz Tê may well be critical here, he has been excellent since joining West Ham. He can often be frustrating with his inconsistency on the ball, but his unpredictability is also a strength. He shoots often, early, from anywhere, with power and occasional stunning accuracy. However, it’s his movement off the ball which could be critical here, he floats and drifts in off the flank to central areas and can creep in at the back post effectively. Of all the players in the West Ham side he has the ability to either change the game or disappear altogether. Blackpool on the other hand will look to Ian Evatt to lead by example from the back. He was first class both on the ground and in the air in dominating Marlon King in the previous games and will need to repeat his performances to control the West Ham attack. Added to this Blackpool have a really assured midfielder in front of him, ready to seize on the loose balls. It isn’t the obvious figure of Barry Ferguson, but in fact Angel Martinez. Martinez has excelled since becoming first choice, he is quick to the ball, but more importantly can work in tight spaces in the deep; which helps Blackpool construct from the back in a really assured manner. He can anticipate astutely and if Blackpool do start to dominate this game, then it’ll be because Martinez has found his rhythm early. Added to this he delivers excellently weighted through balls behind the defence. In fact, there’s little weakness to his game, some may say his size is an issue and therefore, Allardyce may to try to bully him with aggression and pressure from Kevin Nolan. Finally, in attack Blackpool have Matthew Phillips. Although both he and Tom Ince have had outstanding seasons it’s Phillips who West Ham are likely to be most wary of, mainly due to his more direct running and powerful frame. If he gets his confidence high early on in the game by winning his first few duels, then that’ll benefit Blackpool greatly. He is such a strong runner with the ball that he can be imposing and although this tricks lack consistency they can at times throw a whole defence out of balance. It’s likely that the first twenty minutes of this game will be frantic as West Ham attempt to outwork and outrun Blackpool denying them any time and space on the ball in an attempt to suffocate them in to submission. If Blackpool can handle this then the scene will be set for an end to end battle that will end with the winner claimed a rich prize. One club arguably needs the outcome more than the other and finals can produce dynamics that go beyond tactics, so although West Ham are overwhelming favourites, absolutely anything can happen. Blackpool beat Birmingham 3-2 on aggregate after a pulsating game at St Andrews on Wednesday night to reach the Championship playoff final at Wembley for the second time. Blackpool took a two goal lead on the night to extend their aggregate lead from the first leg to 3-0 … Continue reading How did Blackpool beat Birmingham?